If, for some reason, you’ve been living underground in a bunker for the past decade you may not have heard of the Fallout franchise. If this is the case, I am sorry. I urge you to bust open that Vault door, step out into the light, and grab hold of Fallout 4. Fallout 4 follows the same trends that the established franchise has always experienced: vast open-world experience, exceptional story arcs, and riddled with enough bugs to make a radroach colony jealous. I say this to preempt this review, because I want people to understand that just because a game has flaws, doesn’t mean that it’s not a magical, fun experience that should be enjoyed. First off, let me start by saying Fallout 4 has so many complexities, so many side quests, and so much of well – everything, that I can’t begin to cover it all in the scheme of a single review. This game will eat up hours of your life, but you’ll enjoy every minute of it. Even with the technical hiccups that sprinkle themselves throughout the coding, like a frosted doughnut, Fallout 4 is just too good to put down. As in all Fallout games you become the unnamed citizen who escapes the fallout of a nuclear explosion by securing yourself within a Vault, an underground bunker designed with the soul purpose of protecting citizens. In Fallout 4, you are a survivor of Vault 111, finding yourself staggering about the future in search of your family. This is about as much as the game gives you initially, and it’s the perfect way to start things off. The more vague the initial storyline is the more enjoyable an RPG game, such as this, can become. You feel like you have a sense of choice and decision making in Fallout 4 that I hadn’t felt in previous renditions. Fallout is know for giving exceptional player agency, and this is no different, but the method in which they go about it is. The stat system: S.P.E.C.I.A.L, and the massive Perks chart allow for endless possibilities of playthroughs. If you’ve never played, but want to have a specific style I recommend checking out FudgeMuppet on Youtube for specific builds. The biggest change in the Fallout system is V.A.T.S. The “Vault-Tec Assisted Targeting System” has been around in previous renditions, but accessibly, this new version falters where it’s predecessor succeeded. V.A.T.S used to pause the game entirely, which made the game more accessible for players with mobility based limitations to play it. The ability to be able to time your attack and prep where you want to shoot is a necessity to some players. Bethesda has removed this from the game and instead V.A.T.S. now slows down time, instead of fully pausing it. It functions all well and good, but many of the Fallout 4 enemies have faster A.I. and response times than the V.A.T.S has time to slow properly. The actual mechanics of shooting and moving around the vast environment are a rise above that now makes Fallout 4 a less clunky and more like a streamlined shooter. The crafting system in the game is massive, and I mean, MASSIVE. Each and every single piece of gear you can equip can be altered. It is a beautiful thing to behold. Now, no matter what gear you have, know you’re going to experience death – a lot. Fallout 4 doesn’t shy away from making the wasteland of the Commonwealth a beautiful, challenging death trap. If you can bear with the fact that there is key remapping, a requirement of precision skills in lock-picking, and lack of V.A.T.S. pause – you can get through Fallout 4. The soundtrack is beautiful and the dialog between characters, while sometimes expected, is quirky, exceptional, and keeps me coming back for more. The subtitles didn’t always play in certain parts of the game, and often times, would overlap one another if I had a radio signal on. The audio cues and subtitles don’t take away from the accessibility of the gameplay though, so you can finish the game without sound. Visually, it’s the most stunning game I’ve seen to date. The sprawling world of Commonwealth, combined with the lush NPC’s you can experience, gives such a depth that I couldn’t draw myself away. Bethesda has really attacked the visual market by allowing for HUD, subtitle, and menu colors to be adjusted for ease of use. The color pallet for the game is varied enough that it shouldn’t affect colorblind players. I can’t speak to it, because I’m not colorblind myself, but there was nothing jarring or off-putting as I walked around Fallout 4. The subtitles can sometimes be difficult to read, but you can easily get past this by adjusting the color to something you can see from afar. If you can move past some of the jarring visual bugs and crashes, then Fallout 4 will wrap you up in it’s post-apocalyptic beauty. Fallout 4 has one of the most well written and entertaining worlds I’ve ever experienced in a game. The Commonwealth is littered with people, and not just wall flower NPC’s I casually interact with. These companions, characters, and even vendors have such a depth that I wanted to play with each one of them. I wanted to experience their life stories, goals, and ups and downs, as much as I wanted to craft my own. They became a part of my family. I grew eager to see what would happen next on this journey. I now see what Fallout fans have been clamoring about for years. A beautiful world with such character you can’t help but be caught up in the chaos – and spend days exploring every facet of it. It may have it’s hiccups from time to time, and Bethesda could do more to make the game more accessible in future iterations, but this version is quite refined. Fallout 4 gives the player so many options to experience the story however they wish. The crafting systems and settlement building feel like a whole separate game in and of themselves, and I could spend hours just altering my homestead. I haven’t touched the DLC yet, but from what I’ve experienced, I can’t wait. I want to get lost in this world again, and again, soaking up new stories of the Commonwealth like radiated Nuka-Cola. Mods fix a lot of the problems in the PC and XBox One versions, but I wasn’t able to experience these first hand. The review is solely expressed with my PS4 journey, which doesn’t currently allow modding. Tech Talk: Button Mapping Gets Updated! It’s been a while since I’ve ventured into the realm of console gaming. The other day, while playing around with my PS4, I found that they’ve released some pretty awesome updates for game accessibility. In 2012, I was just discovering that game accessibility was a discussion that needed to be had. I hadn’t the slightest idea on where to start though, that was, until I found The AbleGamer’s Foundation. AbleGamers helped to inspire me to create this site and focus on a generation of gaming that would be inclusive, accessible, and fun for everyone. I’m so happy to see that finally we’ve reached a generation of gaming where no matter HOW you play, you are given methods TO play. Inclusion vs. Exclusion. Now, on to the topic at hand: BUTTON MAPPING and other ACCESSIBLE updates. This function allows the user to use a Text to Speech function via the On Screen Keyboard. It’s not perfect as it currently only works via English language setting, but it does allow you to control the system with vocal commands and in messaging in some games. I will say that blind gamers, I want to hear from you because I can imagine you’ll rejoice in this new functionality. It’s only available with some features though, so the limited functionality makes it a work in progress. It provides settings for reading speed and volume of narration [ 3 settings for slow speech, 3 for fast speech ] The functionality is just beginning and it’s going to be a massive boost for players with mobility and vision issues regarding texting, messaging friends, creating groups, etc. I can only hope that this’ll improve to provide more to game experiences as well. The Zoom feature allows the user to Zoom in on items on the screen to see them better. I can’t say how much I appreciate this aspect and it’s fairly simple to accomplish on the fly. You merely have to press the Square and PS button and initiate the Zoom feature. The D-Pad or Analog stick allows you to move the Zoom around the screen. In games like Dragon Age: Inquisition, Witcher 3, etc. I’m overjoyed by this function, because the menus/descriptions/writings are all done in such a small text that it’s often hard for me to see items in-game. The Zoom feature essentially pauses your current game, not allowing you to play the game as long as you’re zoomed in. It only provides one level of Zoom, but that’s more than enough to provide aid. Invert Colors functions exactly like it’s namesake says, and while I would love for them to change “Invert Colors” to an overall “Colorblind Adjustment” feature – the feature works as described. It changes darks to lights, and lights to darks, reds to blues, etc. It can definitely help in certain areas as it functions in both menus and in-game. If you take screenshots though, you’re out of luck. The colors will stay static to the original. I will definitely be taking this functionality for a spin via games like Arkham Knight – where the Detective Modes of some of the characters can be highly disorienting and jarring. If the functionality works on these areas of the game, then I think we’ll have hit a home-run with it’s current functionality. Here’s hoping for further color pallet changes and I’m excited for this one! This function increases the size of text in menus, and presumably in games. I haven’t given it a go in games that have smaller text, but I’m going to give Inquisition a go here in a bit and update if it works. It definitely does a number on being able to read smaller range text. I don’t have great vision and sitting from my couch the Larger Text function works wonders so I don’t have to sit closer/strain my eyes to see. This function increases the visibility of text by making it bolder for the user. It’s pretty much self explanatory. I will say that this function, in it’s current state, only applies to certain aspects of the system like menus. The in-game text stays the same, but I would love to see this functionality expand to games. There are so many games I’ve played where text is too fancy or too small to read from far away. I will test this further, but for now it’s a step that needs further work to be polished. This function increases visibility of text and buttons by, essentially dimming the screen or adjusting colors to make items more visible for players. This is a really nice feature and it works fairly smoothly in most cases. The small test I ran with it: It runs wonders for system menus, reducing the shimmer of the standard PS4 blue. Premium themes, however, are not affected – so I suppose simple is better? In-Game the High Contrast works, but not great. You do get a bit of an adjustment and it is visible, but overall it’s nothing that adjusting your own Brightness and Contrast settings via the game couldn’t already do. It may not work on all games either, I merely used a small sampling of games, but for now it’s a welcome change from what we had before. We’ve all heard of these before. The Closed Captions functionality is nothing ground-breakingly new, as it’s been used via TV shows and movies for years. I was excited about this, however, because I have deaf friends. Closed Captions options would do wonders for their overall enjoyment of gameplay, and I was hoping that it would outshine the standard “Subtitles” functions that most games offer. If it turns out it’s simply for videos and DVD services I’ll say this is an opportunity missed. I’ll have to delve into this in dialogue heavy games, but essentially, it’s supposed to allow for not only subtitle text but sound text/qualifiers during games/movies/etc. I do appreciate the functionality menu being able to be customizable for the Closed Captions. Giving players the option to set color/font/text size/etc. is really a wonderful approach so as to keep the new features from being too intrusive on the game content. Here we are – the promised land. The holy grail that console players have been searching for in accessibility for years. This is it, isn’t it? Isn’t it? Well, sort of. First, let’s start off with what PS4 does well. The functionality and ease of use in this button mapping system is genius and very well done. It allows for the user to pretty much remap any button to any other button. I can officially take the X button and change it to D-Pad Left, or the L2 trigger and change it to O if I want. The combinations are amazing, but why does this affect you – the gamer? Well the functionality is easy to use. You can swap buttons pretty much on the fly by dropping in and out of game to make button configuration changes. The only downside is getting accustomed to your new controller baby. You now have your own personal ‘special-snowflake’ controller, and the game functionality is hard coded. It doesn’t recognize that you changed your X‘s with your Y‘s or your L3‘s with your R1‘s. VERDICT: If you’re a Tutorial based gamer, you’re going to need to train yourself in your new setup, otherwise this is like walking on the moon for gamers. Is there more that can be done? Absolutely. Will there be more done? I certainly well hope so! Now I don’t have an XBOX ONE, so this video above is a nice buffer on exactly what the functionality of each piece does. Let’s start off with Narrator. Narrator is a lovely little device acting much like a digital reader for many. I am fascinated by this functionality [ and if it functions as well in-game as it does in this example…] because it speaks, quite literally, volumes to blind players who could use the benefits of a narrator function to navigate games, menus, etc. The voice is very much like Tom-Tom or the old MS-DOS voice cast, but I’m going to hope that eventually they’ll give us other methods than just speed to adjust the narrator we wish to have. How cool would it be to have a celebrity voice narrate your XBOX experience? This function is identical to the Zoom function on the PS4. However, there is something I’ve noticed that Magnifier does that Zoom does not. It has the ability to zoom further instead of being a static zoom setting. This could be really useful if I’m playing in a highly detailed game and need to spot an objective or a pathway and I can’t clearly see it. It works in menus though, and based on what the Support says about Magnifier it seems that it’ll pause all other controller functionality when Magnifier is on. This function is exclusively for the XBOX video/DVD/Blu Ray functionality. You can create a custom captions style, but the fact that the functionality is limited simply to their video services is pretty short coming. I can’t tell you how many times I’ve talked to deaf gamers who’d prefer if the subtitle/closed captions settings of games gave them the ability to not ONLY read TEXT, but SOUNDS, MOTIONS, etc. If a player knows more of their surroundings, the more they will be immersed in the game. Come on XBOX, get on that bandwagon and make it happen. A cross-game Closed Captions function would make the accessibility market crack open for you guys. It does give the players access to text customization options, but if it’s only for video captions, then it’s falling short of what expectations ought to be. This function is similar to the PS4, however, it’s minimal at best. The only contrast it provides is making the dark areas darker and providing a bright turquoise with white borders instead of the standard color scheme. It also turns off any custom backgrounds and content, so as to ‘unclutter’ the visual space. I think it’s nice, but other than ease of reading it doesn’t change much. I hope it changes aspect like this In-Game as well as Menus. In the battle for best Button Mapping setup, PS4 wins. The simplicity of the XBOX setup, while it may look nice, is only shown in Standard Controller. The Advanced features that extend past 1 configuration setup per user, are only extended to the Elite Controllers. This is something they don’t show you, but if you go to the XBOX ONE Support, you’ll see the Configuration information. The Ease of Use functions are simplistic and easy to use, but with the sort of minimal aspects you can adjust at a time, it’s a bit of a disappointment. I am proud to see that they took into account the need of button configurations, but asking players to buy secondary controllers to gain additional ease of use options for button mapping it’s a shame. I hope that, at some point, the button mapping options will just become standard, but until then, they’ve made a start and it’s lovely. One Input at a Time, We Aim for Access for All. You’re a young boy tossed into a world that’s devoid of color. You’ve found yourself chasing after this white swan in this white devoid environment. You find yourself having to navigate your way and feel your way around by creating silhouettes via splashing black paint on the blank canvas environments. You’re thrown into a kingdom you don’t know anything about, with puzzles and a journey ahead of you that you can’t possibly predict. I would love to finish this storybook! 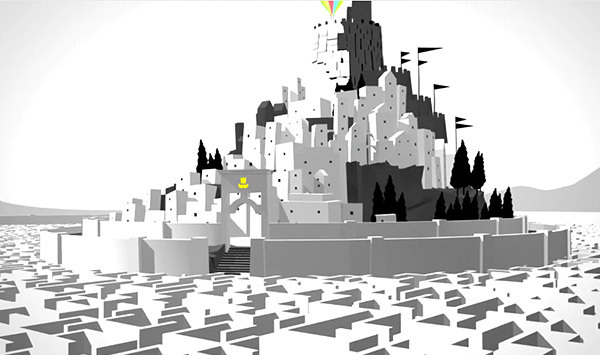 Developed originally by Creative Director, Ian Dallas, the game started off as merely a grad student experiment. Four years later Giant Sparrow has come together via Sony Santa Monica to produce this marvelous, ethereal looking journey for gamers. I can’t even express how excited I am for this game, but what you should know is that it is a PSN Exclusive at this time. The game will also be compatible for Playstation Move and basic Dual-shock controller functionality. Now why is this game so amazing to me? Well I’ve thought about it for a while and I think I’ve come up with a solution. The Unfinished Swan is a tale all it’s own, and it gives gamers a brand new experience I’ve never witnessed in games. I’ve seen other games before that have experimented with paint physics [ Epic Mickey comes to mind ] but never have I seen such a lush and innovative take on the genre. The first person perspective gives players a sensation that I don’t think any game in recent years has given to players. There’s a sense of adventure, mystery, and intrigue for players as they blindly have to feel and craft their way around the vast blank canvas. I truly believe that this game will not only captivate people with it’s simple narrative, but also the gameplay seems extremely accessible. Sure a game where you play as a boy splashing paint around trying to apprehend a swan doesn’t sound like much at first glance, but when you factor in the puzzle mechanics and story driven gameplay you truly see something far greater. Dallas and his team have managed to take a monochromatic color scheme and make it into something fantastic. I loved watching as the paint splatters coated each new object, and how it felt to discover if an object moved, or if a door would open. The Unfinished Swan has so much potential for greatness, that it’s definitely one I’m going to put on my Must Play for 2012. This is gorgeous. Simple, but one of the most gorgeous ascetics I’ve seen! The Unfinished Swan seems to have very little dialog, and when it does there’s text associated with it. The monochromatic/soft color scheme seems perfectly suited to fit any gamer. Colored markers have been placed throughout to provide gamers with long term goals. There seem to be multiple chapters within the game, some with color and some devoid. Dallas mentioned something about enemies within the game. I would love to see some form of combat or puzzle solving involving enemies. There also seems to be environmental puzzles which seem to make a player feel like a part of the creation of the world as they navigate through it. I think this is a fantastic idea. Audio cues seem to pop up when a player completely coats a silhouette. Could this actually allow blind players to play the game? A thought perhaps. Overall The Unfinished Swan seems to be a vast transition and stray from the norm of the market right now. It’s for this reason alone that it’s grasped me so veraciously. Giant Sparrow seems to be onto something that may very well change the way I look at Move technology entirely. I can’t wait to get my hands on the full experience some time soon, and you can bet when I do I’ll let you all know how my quest for The Unfinished Swan goes! The theme of a post-apocalyptic survival game isn’t unheard of, in fact, it’s really quite a prevalent style found in some of the most recent games. I think I’ve found one, however, that’s going to rock the pants off me this upcoming season. Naughty Dog Studios is getting ready to release The Last of Us, a PS3 exclusive that’s far darker, grittier, and more adult than the former hero study of Nathan Drake in Naughty Dog’s Uncharted series. Seriously, the main characters of The Last of Us live such a violent lifestyle that it makes Drake look like a toddler still sucking on a bottle. You play as Joel, a rugged survivor with a brutal attitude, who befriends and takes a young teenager, named Ellie [ Ashley Johnson ] , under his wing. It seems as though you’ll be playing primarily as Joel as you go throughout the game, but the AI of Ellie looks phenomenal. I’m hoping there will be moments within the game where you can switch, or the game switches, the character you play. I understand that Ellie doesn’t really seem like she poses a threat, but I think that’s the strategy of it. It would be a whole new game challenge if you had to deal with drifters, infected, etc. as a young girl vs. a rough and tumble survivalist. There seems to be some sort of infection going on. This was apparent to me since the first few trailers that were ever released for this game. It seems like some sort of fungus, or organic infection, that’s turning any living organism into some sort of zombified cannibalistic creature. This means, not only are you traversing the apocalyptic city scape, but you’re fighting off drifters AND infected as enemies. The infected enemies seem to be dubbed “Clickers” and so I’m stoked to see how they became infected, etc. I also like the inventory system as it seems to be very fluid and easily accessible. The characters seem to mesh well and the vibe of the game seems to be increasingly focused on moment to moment combat, seamlessly ducking in and out of cutscenes and gameplay. Overall, I’m stoked by this game – and even though I know it’s probably going to be rated M for Mature I’m so eager to grab this up like warm, piping blueberry pancakes from a morning skillet! It’s slated to be out some time [ I’m hoping earlier than later ] in 2013. So here’s to hoping the apocalypse doesn’t happen in December so I can focus on my gaming apocalypse in 2013! Thanks Naughty Dog giving me something to look forward to, for providing me with two brand new characters I can now obsess over!